Formulation of plans for coa­stal protection and management and adaptation to climate change effects such as erosion and submersion risks. The focus is on low sandy or pebbly coastal zones and their inlands, the most expo­sed to sea level rise, erosion and submersion risks. What is the state of the art as regards regional policies on coastal protection management? Is it necessary to establish spatial planning regulations for the management of plans to combat coastal erosion? 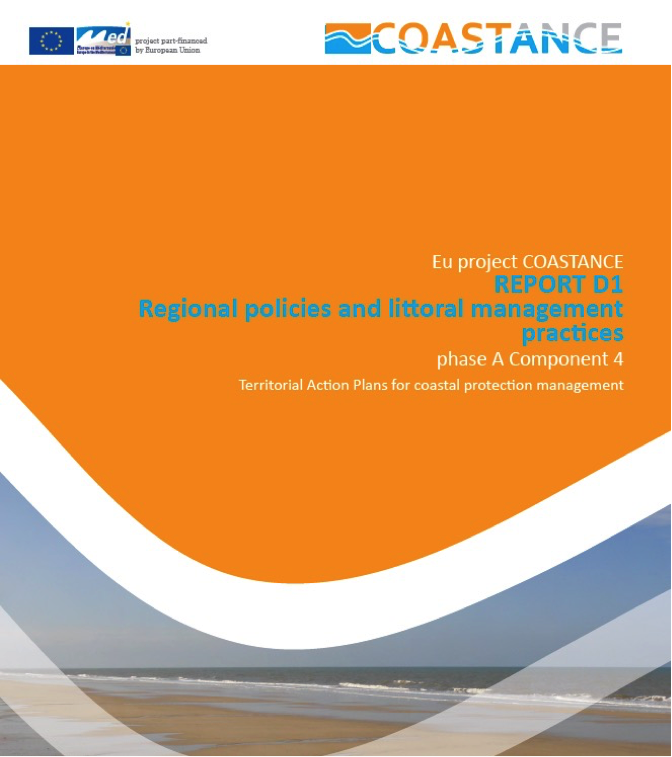 The “Territorial action plans for coastal protection” were developed within the context of the COASTANCE project, and constitutes its Component 4 of activity: Regional policies and littoral management practices. The main aim of Component 4 is the formulation of plans for coastal protection and management and adaptation to climate change effects such as erosion and submersion risks. The focus is on low sandy or pebbly coastal zones and their inlands, the most exposed to sea level rise, erosion and submersion risks. Hard defence structures (e.g. breakwaters, seawalls, groynes), built in the past to remedy suffering situations, often relocated the problem down-drift or anyway to another part of the coast. Very quickly, the limits of these accommodations appeared. New guidelines based on pro-environmental engineering are emerging, focused on the so-called “soft protection” works. Soft options like beach nourishment, while also being temporary and needing regular replenishment, appear more acceptable, and go some way to restore the natural dynamism of the shoreline. • the correct management of sediments within the system in order to balance accumulating vs. retreating coastal stretches and strongly reduce or avoid losses from the littoral system (seaward, eg. by waves and storm actions, land lowering by subsidence phenomena, or landward, eg. wind action, human activities/exploitation). Report D1 Regional policies and littoral management practices Phase A Component 4 “Territorial Action Plan for Coastal Protection Management”, available online here. This exercise of territorial planning for coastal protection management has been tried out in a different range of coastal regions in the West Med (and East Med). In particular, in the Lazio region, Emilia Romagna, Andalucía, L’Hérault Eastern Macedonia & Thrace and some parts of Cyprus. In this way, some of the recommendations can be applicable to other territories that might share some similar challenges. No info specific on the costs for the practice itself. The overall project costs, involving three thematic components, was of 1.9 million euro.